In the previous tutorial, you have learned to create an object in Java. Now, in this tutorial, we are going to learn the Object declaration and initialization in Java with examples. 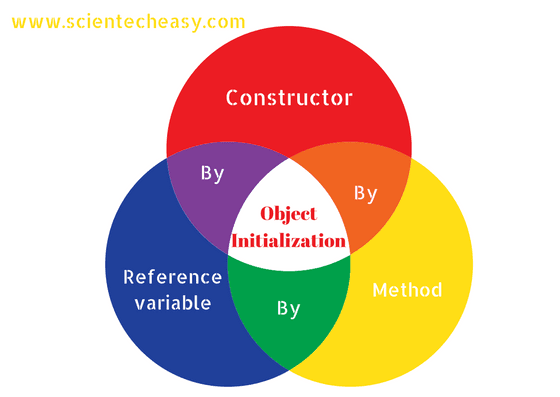 We will learn the different ways to initialize the value or data of the state of the objects inside the class. We will also learn the concept of the Anonymous object in Java. The process of defining the variable along with its data type and name is called the declaration of the state of an object. In a simple way, it is also called a declaration of variable. For example, If we declare the name and city as variables with data type String, these variables are called instance variables in Java. The process of assigning the value of the variable is called initialization of state of an object. In other words, Initialization is the process of storing data into an object. There are three ways by which we can initialize the state of an object i.e the value of variables in Java. 3. By using a method. Let's see one by one with a simple example program step by step. Let's take one simple example where we will store data into the object using a constructor. We can also initialize the value of the object through a reference variable. Let's see a simple program to understand the concept. We can initialize the value of an object by using a method. Let's take an example program. In this example program, we will create two objects of the Rectangle class and initialize the value to these objects by calling the perValue() method. We will display the state(data/value) of the objects by calling the calculate() method using the object reference variable because we cannot call directly the non-static member into the static region. In all the above examples, we declared the main() method inside the class. Now, let's see another example in which we will define the main() method outside the class. It is a better approach than previous examples because we create several classes in real time development and use it from another class. So let's take one more example and follow all the above steps. An object which has no reference variable is called an anonymous object in Java. Anonymous means nameless. If you want to create only one object in a class then the anonymous object is a good approach. The syntax to declare an anonymous object in Java is given below. Let's implement this concept in a program. Hope that this article has covered all the concepts related to the Object declaration and Initialization in Java with examples and program. The concept of the Anonymous object is a very important concept. We will learn more on the anonymous object in a further tutorial in advance. We hope that you will have enjoyed this article.